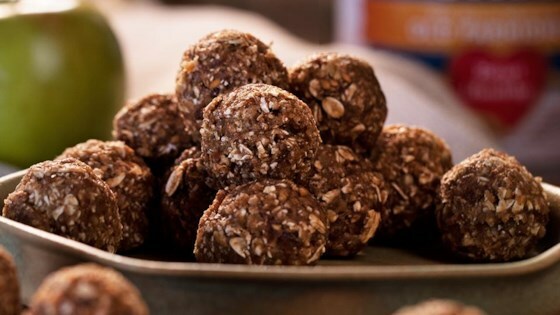 "Oats, dates, apples, walnuts, and flax seeds make tasty little energy bites." Place oats, dates, flax seeds, apple, cinnamon, 1/2 cup walnuts, and honey in the bowl of a food processor. Blend until ingredients form a sticky ball. If desired, add salt to taste preference. With slightly wet hands, form about a tablespoon each into a tight ball. Roll in additional chopped walnuts. Refrigerate, covered, until chilled. Store leftovers in refrigerator, covered. Make a wonderful warm breakfast of simple apple and cinnamon oatmeal. I left out the walnuts and added sunflower seeds. We like them. simple and delicious. Could add a lot of things to this, could coat in any nut, chips, etc. Added a splash of vanilla and used pecans, but otherwise made as directed. These are a nice option for an after run snack.